ST. STEPHEN’S DEFENCE AND THE DOCTRINE OF INSPIRATION. ST. STEPHEN and St. Philip are the two prominent names among the primitive deacons. Stephen, however, much surpasses Philip. 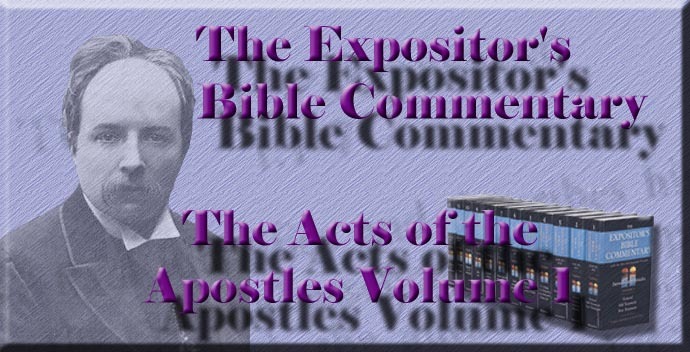 Devout expositors of Scripture have recognised in his name a prophecy of his greatness. Stephen is Stephanos, a garland or crown, in the Greek language. Garlands or crowns were given by the ancient Greeks to those who rendered good services to their cities, or brought fame to them by winning triumphs in the great national games. And Stephen had his name divinely chosen for him by that Divine Providence which ordereth all things, because he was to win in the fulness of time an imperishable garland, and to gain a crown of righteousness, and to render highest services to the Church of God by his teaching and by his testimony even unto death. St. Stephen had a Greek name, and must have belonged to the Hellenistic division of the Jewish nation. He evidently directed his special energies to their conversion, for while the previous persecutions had been raised by the Sadducees, as the persons whose prejudices had been assailed, the attack on Stephen was made by the Grecian Jews of the synagogues belonging to the Libertines or freedmen, in union with those from Cyrene, Alexandria, Cilicia, and Asia. The Libertines had been slaves, Jewish captives, taken in the various wars waged by the Romans. They had been dispersed among the Romans at Rome and elsewhere. There in their captivity they had learned the Greek language and he-come acquainted with Greek culture; and now, when they had recovered their freedom through that suppleness and power of adaptation which the Jewish race has ever displayed, they returned to Jerusalem in such numbers that a synagogue of the Libertines was formed. Their captivity and servitude had, however, only intensified their religious feelings, and made them more jealous of any attempts to extend to the Gentiles who had held them captives the spiritual possessions they alone enjoyed. There is, indeed, an extremely interesting parallel to the case of the Libertines in early English history, as told by Bede. The Saxons came to England in the fifth century and conquered the Christian Celts, whom they drove into Wales. The Celts, however, avenged themselves upon their conquerors, for they refused to impart to the Pagan Saxons the glad tidings of salvation which the Celts possessed.128 But the Libertines were not the only assailants of St. Stephen. With them were joined members of synagogues connected with various other important Jewish centres. Jerusalem was then somewhat like Rome at the present time. It was the one city whither a race scattered all over the world and speaking every language tended. Each language was represented by a synagogue, just as there are English Colleges and Irish Colleges and Spanish Colleges at Rome, where Roman Catholics of those nationalities find themselves specially at home. Among these Hellenistic antagonists of St. Stephen we have mention made of the men of Cilicia. Here, doubtless, was found a certain Saul of Tarsus, enthusiastic in defence of the ancient faith, and urgent with all his might to bring to trial the apostate who had dared to speak words which he considered derogatory of the city and temple of the great king. Saul, indeed, may have been the great agent in Stephen’s arrest. It is a nature and an intellect like his that can discern the logical results of teaching like St. Stephen’s, and then found an accusation upon the deductions he makes rather than upon the actual words spoken. Saul may have placed the Church under another obligation on this occasion. To him may be due the report of the speech made by Stephen before the Sanhedrin. Indeed, it is to St. Paul in his unconverted state we feel inclined to attribute the knowledge which St. Luke possessed of the earlier proceedings of the council in the matter of the Christians.129 After St. Paul’s conversion we get no such details concerning the deliberations of the Sanhedrin as we do in the earlier chapters of the Acts, simply because Saul of Tarsus, the rising champion and hope of the Pharisees, was present at the earlier meetings and had access to their inmost secrets, while at the later meetings he never appeared save to stand his trial as an accused person. The question, How was Stephen’s speech preserved? has been asked by some critics who wished to decry the historic truth of this narrative, and to represent the whole thing as a fancy sketch or romance, worked up on historic lines indeed, but still only a romance, written many years after the events had happened. Critics who ask this forget what modern research has shown in another department. The "Acts" of the martyrs are sometimes very large documents, containing reports of charges, examinations, and speeches of considerable length. These have often been considered mere fancy history, the work of mediaeval monks wishing to celebrate the glory of these early witnesses for truth, and sceptical writers have often put them aside without bestowing even a passing notice upon them. Modern investigation has taken these documents, critically investigated them, compared them with the Roman criminal law, and has come to the conclusion that they are genuine, affording some of the most interesting and important examples of ancient methods of legal procedure anywhere to be found. How did the Christians get these records? it may be asked. Various hints, given here and there, enable us to see. Bribery of the officials was sometimes used. The notaries, shorthand writers, and clerks attendant upon a Roman court were numerous, and were always accessible to the gifts of the richer Christians when they wished to obtain a correct narrative of a martyr’s last trial. Secret Christians among the officials also effected something, and there were numerous other methods by which the Roman judicial records became the property of the Church, to be in time transmitted to the present age.130 Now just the same may have been the case with the trials of the primitive Christians, and specially of St. Stephen. But we know that St. Paul was there. Memory among the Jews was sharpened to an extraordinary degree. We have now no idea to what an extent human memory was then developed. The immense volumes which are filled with the Jewish commentaries on Scripture were in those times transmitted from generation to generatior, simply by means of this power. It was considered, indeed, a great innovation when those commentaries were committed to writing instead of being intrusted to tradition. It is no wonder then that St. Paul could afford his disciple, St. Luke, a report of what Stephen said on this occasion, even if he had not preserved any notes whatsoever of the process of the trial. Let us, however, turn to the consideration of St. Stephen’s speech, omitting any further notice of objections based on our own ignorance of the practices and methods of distant ages. I The defence of St. Stephen was a speech delivered by a Jew, and addressed to a Jewish audience. This is our first remark, and it is an important one. We are apt to judge the Scriptures, their speeches, arguments, and discussions, by a Western standard, forgetting that Orientals argued then and argue still not according to the rules of logic taught by Aristotle, nor by the methods of eloquence derived from the traditions of Cicero and Quinctilian, but by methods and rules essentially different. What would satisfy Westerns would have seemed to them utterly worthless, just as an argument which now seems pointless and weak appeared to them absolutely conclusive. Parallels, analogies, parables, mystical interpretations were then favourite methods of argument, and if we wish to understand writers like the authors of the scriptural books we must strive to place ourselves at their point of view, or else we shall miss their true interpretation. Let us apply this idea to St. Stephen’s defence, which has been often depreciated because treated as if it were an oration addressed to a Western court or audience. Erasmus, for instance, was an exceedingly learned man, who lived at the period of the Reformation. He was well skilled in Latin and Greek learning, but knew nothing of Jewish. ideas. He hesitates not, therefore, to say in his Annotations on this passage that there are many things in Stephen’s speech which have no-bearing on the question at issue; while Michaelis, another German writer of great repute in the: earlier days of this century, remarks that there are many things in this oration of which we cannot perceive the tendency, as regards the accusation brought against the martyr. Let us examine and see if the case be not otherwise, remembering that promise of the Master, given not to supersede human exertion or to indulge human laziness, but given to support and sustain and safeguard His persecuted servants under circumstances like those amid which Stephen found himself. "But when they deliver you up, be not anxious how or what ye shall speak; for it shall be given you in that hour what ye shall speak. For it is not ye that speak, but the Spirit of your Father that speaketh in you." What, then, was the charge brought against Stephen? He was accused of "speaking blasphemous words against Moses, and against God," or, to put it in the formal language used by the witnesses, "We have heard him say that Jesus of Nazareth shall destroy this place, and shall change the customs which Moses delivered unto us." Now Stephen, if merely a man of common sense, must have intended to reply, to this indictment. Some critics, as we have just noted, think that he failed effectually to do so. We are indeed often in great danger of paying too much attention and lending too great weight to objections of this kind urged by persons who assume to themselves the office of critics; and to counteract this tendency perhaps it is as well to note that a leading German writer of a rationalistic type, named Zeller, who has written a work to decry the historical character of the Acts, finds in St. Stephen’s words an oration "not only characteristic, but also better suited to the case and to the accusation raised against him than is usually supposed." Disregarding, then, all cavils of critics whose views are mutually destructive, let us see if we cannot discern in this narrative the marks of a sound and powerful mind, guided, aided, and directed by the Spirit of God which dwelt so abundantly in him. St. Stephen was accused of irreverence towards Moses and hostility towards the temple, and towards all the Jewish institutions. How did he meet this? He begins his address to the Sanhedrin at the earliest period of their national history, and shows how the chosen people had passed through many changes and developments without interfering with their essential identity amid these changes. His opponents now made idols of their local institutions and of the buildings of the temple, but God’s choice and God’s promise had originally nothing local about them at all. Abraham, their great father, was first called by God in Ur of the Chaldees, far away across the desert in distant Mesopotamia. Thence he removed to Charran, and then, only after the lapse of years, became a wanderer up and down in Canaan, where he never possessed so much of the land as he could set his foot upon. The promises of God and the covenant of grace were personal things, made to God’s chosen children, not connected with lands or buildings or national customs. He next takes up the case of Moses. He had been accused of blasphemy and irreverence towards the great national law-giver. His words prove that he entertained no such feelings; he respected and revered Moses just as much as his opponents and accusers did. But Moses had nothing to say or do with Canaan, or Jerusalem, or the temple. Nay, rather, his work for the chosen people was alone in Egypt and in Midian and on the side of Horeb, where the presence and name of Jehovah were manifested not in the temple or tabernacle, but in the bush burning yet not consumed. The Grecian Jews accused Stephen of irreverence towards Moses. But how had their forefathers treated that Moses whom he recognised as a divinely-sent messenger? "They thrust him from them, and in their hearts turned back again into Egypt." Moses, however, led them onward and upward. His motto was hope. His rod and his voice ever pointed forward. He warned them that his own ministry was not the final one; that it was only an intermediate and temporary institution, till the prophet should come unto whom the people should hearken. There was a chosen people before the customs introduced by Moses. There may therefore be a chosen people still when these customs cease, having fulfilled their purpose. The argument of St. Stephen in this passage is the same as that of St. Paul in the fourth-chapter of Galatians, where he sets forth the temporary and intermediate character of the Levitical law and of the covenant of circumcision. So teaches St. Stephen in his speech. His argument is simply this:—I have been accused of speaking blasphemous words against Moses because I proclaimed that a greater Prophet than he had come, and yet this was only what Moses himself had foretold. It is not I who have blasphemed and opposed Moses: it is my accusers rather. But then he remembers that the accusation dealt not merely with Moses. It went farther, and accused him of speaking blasphemous words against the national sanctuary, "saying that Jesus of Nazareth shall destroy this place." This leads him to speak of the temple. His argument now takes a different turn, and runs thus. This building is now the centre of Jewish thoughts and affections. But it is a mere modern thing, as compared with the original choice and promise of God. There was no chosen dwelling-place of the Almighty in the earliest days of all; His presence was then manifested wherever His chosen servants dwelt. Then Moses made a tent or tabernacle, which abode in no certain spot, but moved hither and thither. Last of all, long after Abraham, and long after Moses, and even after David, Solomon built God a house. Even when it was built, and in all its original glory, even then the temporary character of the temple was clearly recognised by the prophet Isaiah, who had long ago, in his sixty-sixth chapter, proclaimed the truth which had been brought forward as an accusation against himself: "Heaven is My throne, and earth is My footstool; what house will ye build Me, saith the Lord, or what is the place of My rest? Hath not My hand made all these things? "—a great spiritual truth which had been anticipated long before Isaiah by King Solomon, in his famous dedication prayer at the opening of the temple: "But will God indeed dwell on the earth? Behold the heaven and the heaven of heavens cannot contain Thee; how much less this house that I have builded." (1Ki 8:27) After St. Stephen had set forth this undeniable truth confirmed by the words of Isaiah, which to the Pharisaic portion of his audience, at least, must have seemed conclusive, there occurs a break in the address. One would have thought that he would then have proceeded to describe the broader and more spiritual life which had shone forth for mankind in Christ, and to expound the freedom from all local restrictions which should henceforth belong to acceptable worship of the Most High. Most certainly, if the speech had been invented for him and placed in his mouth, a forger would naturally have designed a fuller and more balanced discourse, setting forth the doctrine of Christ as well as the past history of the Jews. We cannot tell whether he actually entered more fully into the subject or not. Possibly the Sadducean portion of his audience had got quite enough. Their countenances and gestures bespoke their horror of St. Stephen’s doctrine. Isaiah’s opinion carried no weight with them as contrasted with the institutions of Moses, which were their pride and glory; and so, borne along by the force of his oratory, St. Stephen finished with that vigorous denunciation which led to his death: "Ye stiffnecked and uncircumcised in heart and ears, ye do always resist the Holy Ghost: as your fathers did, so do ye." This exposition of St. Stephen’s speech will show the drift and argument of it as it appears to us. But it must have seemed to them much more powerful, plain-spoken, and aggressive. He vindicated himself to any right-thinking and fair mind from the accusation of irreverence towards God, towards Moses, or towards the Divine institutions. But the minds of his hearers were not fair. He had trampled upon their prejudices, he had suggested the vanity of their dearest ideas, and they could not estimate his reasons or follow his arguments, but they could resort to the remedy which every failing, though for the present popular, cause possesses—they could destroy him. And thus they treated the modern as their ancestors had treated the ancient prophets. What a lesson Stephen’s speech has for the Church of every age! How wide and manifold the applications of it! The Jewish error is one that is often committed, their mistake often repeated. The Jews identified God’s honour and glory with an old order that was fast passing away, and had no eyes to behold a new and more glorious order that was opening upon them. We may blame them then for their murder of St. Stephen, but we must blame them gently, feeling that they acted as human nature has ever acted under similar circumstances, and that good motives were mingled with those feelings of rage and bigotry and narrowness that urged them to their deed of blood. Let us see how this was. Stephen proclaimed a new order and a new development, embracing for his hearers a vast political as well as a vast religious change. His forecast of the future swept away at once all the privileges and profits connected with the religious position of Jerusalem, and thus destroyed the political prospects of the Jewish people. It is no wonder the Sanhedrin could not appreciate his oration. Men do not ever listen patiently when their pockets are being touched, their profits swept away, their dearest hopes utterly annihilated. Has not human experience often repeated the scene acted out that day in Jerusalem? On the political stage men have often seen it, -we ourselves have seen it. The advocates of liberty, civil and religious, have had to struggle against the same spirit and the same prejudices as St. Stephen. Take the political world alone. We now look back and view with horror the deeds wrought in the name of authority and in opposition to the principles of change and innovation. We read the stories of Alva and the massacres in the Netherlands, the bloody deeds of the seventeenth century in England and all over Europe, the miseries and the bloodshed of the American war of independence, the fierce opposition with which the spirit of liberty has been resisted throughout this century; and our sympathies are altogether ranged on the side of the sufferers, -the losers and defeated, it may have been, for the time, but the triumphant in the long run. The true student, however, of history or of human nature will not content himself with any one-sided view, and he will have some sympathy to spare for those who adopted the stern measures. He will not judge them too harshly. They reverenced the past as the Jews of Jerusalem did, and reverence is a feeling that is right and blessed. It is no good sign for this age of ours that it possesses so little reverence for the past, thinks so lightly of the institutions, the wisdom, the ideas of antiquity, and is ready to change them at a moment’s notice. The men who now are held up to the execration of posterity, the high priest and the Sanhedrin who murdered Stephen, the tyrants and despots and their agents who strove to crush the supporters of liberty, the writers who cried them down and applauded or urged on the violent measures which were adopted and sometimes triumphed for the time, -we should strive to put ourselves in their position, and see what they had to say for themselves, and thus seek to judge them here below as the Eternal King will judge them at the great final tribunal. They knew the good which the old political institutions had worked. They had lived and flourished under them as their ancestors had lived and flourished before them. The future they knew not. All they knew was that changes were proposed which threatened everything with which their dearest memories were bound up, and the innovators seemed dangerous creatures, obnoxious to God and man, and they dealt with them accordingly. So it has been and still is in politics. The opponents of political change are sometimes denounced in the fiercest language, as if they were morally wicked. The late Dr. Arnold seems a grievous offender in this respect. No one can read his charming biography by Dean Stanley without recognising how intolerant he was towards his political opponents; how blind he was to those good motives which inspire the timorous, the ignorant, and the aged, when brought face to face with changes which appear to them thickly charged with the most dangerous results. Charity towards opponents is sadly needed in the political as well as in the religious world. And as it has been in politics so has it been in religion. Men reverence the past, and that reverence easily glides into an idolatry blind to its defects and hostile to any improvement. It is in religion too as in politics; a thousand other interests—money, office, expectations, memories of the loved and lost—arebound up with old religious forms, and then when the prophet arises with his Divine message, as Stephen arose before the Sanhedrin, the ancient proverb is fulfilled, the corruption of the best becomes the worst, the good motives mingle with the evil, and are used by the poor human heart to justify the harshest, most unchristian deeds done m defence of what men believe to he the cause of truth and righteousness. Let us be just and fair to the aggressors as well as to the aggrieved, to the persecutors as well as to the persecuted. But let us all the same take good heed to learn for ourselves the lessons this narrative presents. Reverence is a good thing, and a blessed thing; and without reverence no true progress, either in political or spiritual things, can be made. But reverence easily degenerates into blind superstitious idolatry. It was so with the Sanhedrin, it was so at the Reformation, it has ever been so with the opponents of true religious progress. Let us evermore strive to keep minds free, open, unbiassed, respecting the past, yet ready to listen to the voice and fresh revelations of God’s will and purposes made to us by the messengers whom He chooses as He pleases. Perhaps there was never an age which needed this lesson of Stephen’s speech and its reception more than our own. The attitude of religious men towards science and its numerous and wondrous advances needs guidance such as this incident affords. The Sanhedrin had their own theory and interpretation of God’s dealings in the past. They clung to it passionately, and refused the teaching of Stephen, who would have widened their views, and shown them that a grand and noble development was quite in accordance with all the facts in the case, and indeed a necessary result of the sacred history when truly expounded! What a parable and picture of the future we here find! What a warning as to the attitude religious men should take up with respect to the progress of science! Patience, intellectual and religious patience, is taught us. The Sanhedrin were impatient of St. Stephen’s views, which they could not understand, and their impatience made them lose a blessing and commit a sin. Now has it not been at times much the same with ourselves? Fifty or sixty years ago men were frightened at the revelations of geology, -they had their own interpretations of the past and of the Scriptures, -just as three centuries ago men were frightened at the revelations and teaching of modern astronomy. Prejudiced and narrow men then strove to hound down the teachers of the new science, and would, if they could, have destroyed them in the name of God. Patience, here, however, has done its work and has had its reward. The new revelations have been taken up and absorbed by the Church of Christ. Men have learned to distinguish between their own interpretations of religion and of religious documents on the one hand and the religion itself on the other. The old, human, narrow, prejudiced interpretations have been modified. That which could be shaken and was untrue has passed away, while that which cannot be shaken has remained. The lesson taught us by these instances of astronomy and geology, ought not to be thrown away. Patience is again necessary for the Christian and for the scientist alike. New facts are every day coming to light, but it requires much time and thought to bring new facts and old truths into their due correlation, to look round and about them. The human mind is at best very small and weak. It is blind, and cannot see afar off, and it is only by degrees it can grasp truth in its fulness. A new fact, for instance, discovered by science may appear at first plainly contradictory to some old truth revealed in Scripture. But even so, we should not lose our patience or our hope taught us by this chapter. What new fact of science can possibly seem more contradictory to any old truth of the Creeds than St. Stephen’s teaching about the universal character of God’s promise and the freeness of acceptable worship must have seemed when compared with the Divine choice of the temple at Jerusalem? They appeared to the Sanhedrin’s ideas mutually destructive, though now we see them to have been quite consistent one with another. Let this historic retrospect support us when our faith is tried. Let us welcome every new fact and new revelation brought by science, and then, if they seem opposed to something we know to be true in religion, let us wait in confidence, begotten of past experience, that God in His own good time will clear up for His faithful people that which now seems difficult of comprehension. Patience and confidence, then, are two lessons much needed in this age, which St. Stephen’s speech and its reception bring home to our hearts. The hand has finished ere the tongue has said." While even if the Jews knew nothing of shorthand, the human memory, as we have already noted, was then developed to a degree of which we have no conception. Now, whether transmitted by memory or by notes, this address of St. Stephen bears proofs of the truthfulness of the reporter in the mistakes it contains. A man anxious for the reputation of his hero would have corrected them, as parliamentary reporters are accustomed to make the worst speeches readable, correcting evident blunders, and improving the grammar. The reporter of St. Stephen’s words, on the contrary, gave them to us just as they were spoken. But then, I may be asked, how do you account for St. Stephen’s mistake? What explanation can you offer? My answer is simple and plain enough. I have no other explanation to offer except that they are mistakes such as a speaker, filled with his subject, and speaking to an excited and hostile audience, might naturally make; mistakes such as truthful speakers every day make in their ordinary efforts. Every man who speaks an extemporaneous discourse such as Stephen’s was, full of references to past history, is liable to such errors. Even when the memory retains the facts most accurately, the tongue is apt to make such lapses. Let a number of names be mingled up together in a speech or sermon where frequent mention has to be made of one now and of another again, how easily in that case a speaker substitutes one for another. But it may be objected that it is declared of Stephen that he was "full of the Holy Ghost and wisdom," that "he was full of faith and power," and that his adversaries "were not able to resist the wisdom and the spirit with which he spake." But surely this might be said of able, devoted, and holy men at the present day, and yet no one would say that they were miraculously kept from the most trivial mistakes, and that their memories and tongues were so supernaturally aided that they were preserved from the smallest verbal inaccuracies. We are always inclined to reverse the true scientific method of inquiry, and to form notions as to what inspiration must mean, instead of asking what, as a matter of fact, inspiration did mean and involve in the case of the Bible heroes. People when they feel offended by these mistakes of St. Stephen prove that they really think that Christianity was quite a different thing in the apostolic days from what it is now, and that the words "full of the Holy Ghost" and the presence of the Divine Spirit meant quite a different gift and blessing then from what they imply at the present time. I look upon the mistakes in this speech in quite a different light. St. Luke, in recording them exactly as they took place, proves, not merely his honesty as a narrator, but he also has handed down to us a most important lesson. He teaches us to moderate our notions and to hasten our à priori expectations. He shows us we must come and study the Scriptures to learn what they mean by the gift and power of the Holy Spirit. St. Luke expressly tells us that Stephen was full of the Holy Ghost, and then proceeds to narrate certain verbal inaccuracies and certain slips of memory to prove to us that the presence of the Holy Ghost does not annihilate human nature, or supersede the exercise of the human faculties. Just as in other places we find Apostles like St. Peter or St. Paul spoken of as equally inspired, and yet the inspiration enjoyed by them did not destroy their human weakness and infirmities, and, full of the Holy Ghost as they were, St. Paul could wax wroth and engage in bitter dissension with Barnabas, his fellow-labourer; and St. Peter could fall into hypocrisy against which his brother Apostle had publicly to protest. It is wonderful how liable the mind is, m matters of religion, to embrace exactly the same errors age after age, manifesting themselves in different shapes. Men are ever inclined to form their theories beforehand, and then to test God’s actions and the course of His Providence by those theories, instead of reversing the order, and testing their theories by facts as God reveals them. This error about the true theory of inspiration and the gifts of the Holy Ghost which Protestants have fallen into is exactly the same as two celebrated mistakes, one in ancient, the other in modern times. The Eutychian heresy was very celebrated in the fifth century. It split the Eastern Church into two parts, and prepared the way for the triumph of Mahometanism. It fell, too, into this same error. It formed a à priori theory of God and His nature. It determined that it was impossible for the nature of Deity to be united to a nature which could feel hunger and thirst and weakness, because that God cannot be affected by any human weakness or wants. It denied, therefore, the real humanity of the Lord Jesus Christ and the reality of His human life and actions; teaching that His human body was not real, but merely a phenomenal or apparent one, and then explaining away all the statements and facts of Gospel history which seemed to them to conflict with their own private theory. In the West we have had ourselves experience of the same erroneous method of argument. The adherents of the Church of Rome argue for the infallibility of the Pope in the same way. They dilate on the awful importance of religious truth, and the fearful consequences of a mistake in such matters. Hence they conclude that it is only natural and fitting that a living, speaking, teaching, infallible guide should be appointed by God to direct the Church, and thence they conclude the infallibility of the Pope; a method of argument which has been amply exposed by Dr. Salmon in his work on the Infallibility of the Church. The Roman Catholics form their theory first, and when they come to facts which conflict with their theory, they deny them or explain them away in the most extraordinary manner. Protestants themselves, however, are subject to the same erroneous methods. They form a theory about the Holy Ghost and His operations. They conclude, as is true, that He is Himself right and just and true in all His doings, and then they conclude that all the men whom He chose in the earliest age of the Church, and who are mentioned in Scripture as endued with His grace, must have been as free from every form of error as the Holy Spirit Himself. They thus fashion for themselves a mere à priori theory like the Eutychian and the Romanist, and then, when they apply their theory to passages like St. Stephen’s speech, they feel compelled to deny facts and offer forced explanations, and to reject God’s teaching as it is embodied in the divinely taught lessons of history. Let us be honest, fearless students of the Scriptures. St. Stephen was full of the Holy Ghost, and as such his great, broad, spiritual lessons were taught by the Spirit, and commend themselves as Divine teaching to every Christian heart. But these lessons were given through human lips, and had to be conveyed through human faculties, and as such are not free from the imperfections which attach themselves to everything human here below. Surely it is just the same still. God the Holy Ghost dwells with His people as of old. There are men, even in this age, of whom it still may be said, that in a special sense "they are full of the Holy Ghost," a blessing granted in answer to faithful prayer and devout communion and a life lived closely with God. The Holy Spirit speaks through them and in them. Their sermons, even on the simplest topics, speak with power, they teem with spiritual unction, they come home with conviction to the human conscience. Yet surely no one would dream of saying that these men are free from slips of speech and lapses of memory in their extemporaneous addresses, or in their private instructions, or in their written letters, because the Holy Ghost thus proves His presence and His power in His people as of old. The human heart and conscience easily and at once distinguish between that which is due to human weakness and what to Divine grace, according to that most pregnant saying of an Apostle himself gifted above all others, "We have this treasure m earthen vessels, that the excellency of the power may be of God and not of us." This view may be startling to some persons who have been accustomed to look to the Bible as some persons look to the Pope, as an oracle which will give them infallible guidance on every topic without the exercise of any thought or intelligence on their own part. Yet it is no original or novel notion of my own, but one that has been luminously set forth by a devout expositor of Scripture, dealing with this very passage many years ago. Dr. Vaughan, in his lectures on the Acts, preaching at Doncaster when vicar of that place, thus states his conclusions on this point:—"Now I will address one earnest word to persons who may have noticed with anxiety in this chapter, or who may have heard it noticed by others in a tone of cavil or disbelief, that in one or two minor points the account here given of Jewish history seems to vary from that contained in the narrative of the Old Testament. For example, the history of the book of Genesis tells us that the burying-place bought by Abraham was in Mamre or Hebron, not at Sychem; and that it was bought by him of Ephron the Hittite, Jacob (not Abraham) being the purchaser of the ground at Shechem of the sons of Hamor, Shechem’s father. My friends, can you really suppose that a difference of this nature has anything to do, this way or that, with the substantial truth of the gospel revelation? I declare to you that I would not waste the time in endeavouring (if I was able) to reconcile such a variance. It is to be regretted that Christian persons, in their zeal for the literal accuracy of our Holy Book, have spoken and written as if they thought that anything could possibly depend upon such a question. We all know how easy it is to get two witnesses in a court of justice to give their stories of an occurrence in the same words. We know also how instant is the suspicion of falsehood which that formal coincidence of statement brings upon them. Holy Scripture shows what I may indeed call a noble superiority to all such uniformity. Each book of our Bible is an independent witness; shown to be so, not least, by verbal or even actual differences on some trifling points of detail. And they who drink most deeply at the fountain head of Divine truth learn to estimate these things in the same manner; to feel what we might describe as a lordly disdain for all infidel objections drawn from this sort of petty, paltry, cavilling, carping, creeping criticism. Let our faith at last, God helping us, be strong enough and decided enough to override a few or a multitude of such objections. We will hear them unmoved; we will fearlessly examine them; if we cannot resolve them, then, in the power of a more majestic principle, we will calmly turn from them and pass them by. What we know not now, we may know hereafter; and if we never know we will believe still." These are wise words, very wholesome, very practical, and very helpful in this present age. III Let us briefly gather yet another lesson from this passage. The declaration of the Church’s catholicity and the universal nature of Christian worship contained in verses 47-50 deserve our attention. What did St. Stephen say?—"But Solomon built Him a house. Howbeit the Most High dwelleth not in houses made with hands; as saith the prophet, The heaven is My throne, and the earth the footstool of My feet; what manner of house will ye build Me? saith the Lord; or what is the place of My rest? Did not My hand make all these things?" These words must have sounded as very extraordinary and very revolutionary in Jewish ears, because they most certainly struck at the root of the exclusive privilege claimed for Jerusalem, that it was the one place upon earth where acceptable worship could be offered, and where the Divine presence could be manifested. It seems no wonder that they should have aroused the Sanhedrin to the pitch of fury which ended in the orator’s judicial murder. But these words have been at times pressed farther than Stephen intended. He merely wished to teach that God’s special and covenanted presence was not for the future to be limited to Jerusalem. In the new dispensation of the Messiah whom he preached, that special covenanted presence would be found everywhere. Where two or three should be gathered in Christ’s name there would God’s presence be found. These words of Stephen have sometimes been quoted as if they sounded the death-knell of special places dedicated to the honour and glory of God, such as churches are. It is evident, however, that they have no such application. They sounded the death-knell of the exclusive privilege of one place, the temple, but they proclaimed the freedom which the Church has ever since claimed, and the Jewish Church of the dispersion, by the institution of synagogues, had led the way in claiming; teaching that wherever true hearts and true worshippers are found, there God reveals Himself. But we must bear in mind a distinction. Stephen and the Apostles rejected the exclusive right of the Temple as the one place of worship for the world. They asserted the right to establish special places of worship throughout the world. They rejected the exclusive claims of Jerusalem. But they did not reject the right and the duty of God’s people to assemble themselves as a collective body for public worship, and to realise Christ’s covenanted presence. This is an important limitation of St. Stephen’s statement. The absolute duty of public collective worship of the Almighty cannot be too strongly insisted upon. Men neglect it, and they support themselves by an appeal to St. Stephen’s words, which have nothing to do with public worship more than with private worship. The Jews imagined that both public and private worship offered in the Temple had some special blessing attached, because a special presence of God was there granted. St. Stephen attacked this prejudice. His words must, however, be limited to the exact point he was then dealing with, and must not be pressed farther. Private prayer was binding on all God’s people in the new and freer dispensation, and so, too, public worship has a special covenant blessing attached to it, and the blessing cannot be obtained if people neglect the duty. Public worship has been by Protestants looked at too much, as if it were only a means of their own edification, and thus, when they have thought that such edification could be as well or better attained at home, by reading a better sermon than they might chance to hear in the public congregation, they have excused their absence to their own conscience. But public worship is much more than a means of edification. It is the payment of a debt of worship, praise, and adoration due by the creature to the Creator. In that duty personal edification finds a place, but a mere accidental and subsidiary place. The great end of public worship is worship, not hearing, not edification even, though edification follows as a necessary result of such public worship when sincerely offered. The teaching of St. Stephen did not then apply to the erection of churches and buildings set apart for God’s service, or to the claim made for public worship as an exercise with a peculiar Divine promise annexed. It simply protests against any attempt to localise the Divine presence to one special spot on earth, making it and it alone the centre of all religious interest. St. Stephen’s words are indeed but a necessary result of the ascension of Christ as we have already expounded its expediency. Had Christ remained on earth, His’ personal presence would have rendered the Church a mere local and not a universal institution; just as the doctrine of Roman Catholics about the Pope as Christ’s Vicar, and Rome as his appointed seat, has so far invested Rome with somewhat of the characteristics of Jerusalem and the Temple. But our Lord ascended up on high that the hearts and minds of His people might likewise ascend to that region where, above time and sense and change, their Master evermore dwells, as the loadstone which secretly draws their hearts, and guides their tempest tossed spirits across the stormy waters of this world to the haven of everlasting rest. See Bede's Ecclesiastical History , Book ii., chap. 2. I have already said something on p. 181 of the meetings of the council, but not perhaps quite enough to explain St. Paul's relation to St. Luke as far as the Acts of the Apostles is concerned. The Sanhedrin sat in a semicircle. In the centre of the arc the president was placed; at either extremity there sat a scribe, while the disciples or pupils of the Sanhedrists were arranged in three rows appropriate to their respective attainments. In Selden's Works , i., 1323, in his treatise on the Assemblies of the Hebrews , the reader can see a plan of the Sanhedrin when sitting. St. Paul, as a favourite pupil of the President Gamaliel, would have the best place among the disciples, if he were not actually one of the council. Selden says that the disciples were arrayed in this prominent position not only that they might be instructed in law, but also might be available for serving on the council if any member died suddenly or was taken ill. St. Paul probably made numerous notes of the speeches delivered before him, and could supply St. Luke with notices written and verbal. The article in Schaff's Theological Cyclopædia on Sanhedrin should be consulted for more information and references on this point, as well as the other references on p. 181. M. Le Blant is one of the greatest living authorities on ancient art and history. He has been head of the French Archæological School at Rome. He has published an extremely able work on the subject of the Acts of the martyrs, in which he treats them in a strictly scientific manner. He confronts them with the processes of Roman law, the facts of chronology and history, and triumphantly shows the vast amount of truth contained in these documents. He also explains how the Christians got possession of the Roman magistrates' notes, which they then inserted in the local Church records, and dispersed amid other Churches, after the manner of the Epistle of the Lyonnese Church, to which reference has been already made. Le Blant, on p. 9 of his memoir, quotes one ancient document, which incidentally mentions that "inasmuch as it was necessary to collect all the records of the martyrs' confessions, the Christians paid one of the javelin men two hundred denarii for the privilege of transcribing them." We are apt to forget that both Jews and Romans conducted all their persecutions under strict judicial forms. We sometimes think that the persecutions were mere outbursts of popular rage, managed after the manner of a street riot. The examples of the magistrates at Corinth and Ephesus in the Acts of the Apostles ought to dispel this illusion. The Romans had a perfect horror of civil commotions, and sternly repressed them. If a sect was to be put down, it should be put down in a legal manner, with questions and answers and due records of the proceedings. See p. 108 above, where I have touched on this point.